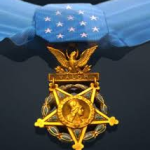 My friend and colleague, Duane A. Vachon, Ph.D, has been writing a column on Medal of Honor recipients for the Hawaii Reporter for several years. He recently asked me what I knew about the Battle of Wounded Knee, saying that his research was suggesting that the MOH recipients might not be entitled to the honor because it was more of a massacre than a battle. I knew about Wounded Knee, but took an evening to revisit the historical sources, look into the debate over rescinding awards, and to consider the standards for the nation’s highest honor. I didn’t have to look far for a MOH recipient who measured above and beyond: Wake Island’s “Hammerin’ Hank” Elrod. For conspicuous gallantry and intrepidity at the risk of his life above and beyond the call of duty while attached to Marine Fighting Squadron TWO HUNDRED ELEVEN, during action against enemy Japanese land, surface and aerial units at Wake Island, from 8 to 23 December 1941. Engaging vastly superior forces of enemy bombers and warships on 9 and 12 December, Captain Elrod shot down two of a flight of twenty-two hostile planes and, executing repeated bombing and strafing runs at extremely low altitude and close range, succeeded in inflicting deadly damage upon a large Japanese vessel, thereby sinking the first major warship to be destroyed by small caliber bombs delivered from a fighter-type aircraft. When his plane was disabled by hostile fire and no other ships were operative, Captain Elrod assumed command of one flank of the line set up in defiance of the enemy landing and conducting a brilliant defense, enabled his men to hold their positions and repulse determined Japanese attacks, repeatedly proceeding through intense hostile fusillades to provide covering fire for unarmed ammunition carriers. Capturing an automatic weapon during one enemy rush in force, he gave his own firearm to one of his men and fought on vigorously against the Japanese. Responsible in a large measure of the strength of his sector’s gallant resistance, on 23 December, Captain Elrod led his men with bold aggressiveness until he fell, mortally wounded. His superb skill as a pilot, daring leadership and unswerving devotion to duty distinguished him among the defenders of Wake Island, and his valiant conduct reflects the highest credit upon himself and the United States Naval Service. He gallantly gave his life for his country. Over three thousand Medals of Honor have been awarded since 1863, when the medal was first authorized by President Abraham Lincoln. In the early decades the standards and policies were loosely defined and by the 1890s such a flood of old civil war veterans or their families were applying that President William McKinley directed the army to establish new policies to ensure the integrity of the honor. The concept of conduct “above and beyond” the normal discharge of duty, eyewitness testimony to the incident, and a ban on self-nomination were among the new standards. In 1916 a new army board was established under Lt. General Nelson Miles (see below) to review all awards to date. The famous 1917 purge rescinded 911 Medals of Honor, including more than 800 awarded to a Marine battalion for staying beyond their Civil War enlistments to protect Washington DC. (A typo had extended the award to the full battalion, only some of whom stayed in DC an extra four days.) A half-dozen awards to civilians, including Buffalo Bill Cody, were rescinded, though most were later restored. In recent years there have been several efforts to rescind the twenty Medals of Honor that were awarded to U. S. Army soldiers for their service in the 1890 Battle of Wounded Knee in South Dakota. In late December 1890 about three hundred Lakota Sioux, followers of the non-violent Ghost Dance movement, fled their agencies when army troops of the 7th Cavalry were sent in to quell a possible rebellion. (The troops were led by General Nelson Miles; the 7th Cavalry had been reformed after the 1876 Battle of Little Big Horn, Custer’s last stand in an ambush by Lakota, Cheyenne, and Arapahoe forces.) The troops pursued the fleeing bands and herded them into a camp by Wounded Knee Creek. Armed soldiers surrounded the camp, and set up four big Hotchkiss guns. When the soldiers began to search the tipis for weapons, a shot rang out, and mayhem ensued as the army guns and cannon opened up on men, women, and children until most were dead or dying. Twenty-five soldiers died and 39 were wounded, many likely from friendly fire as the army guns had fired from all sides. Gallantry and intrepidity by the measure of Hammerin’ Hank? I think not. See Wounded Knee Medals of Honor for more.